This is part of FXEmpire’s continuing series of special features on trader education, and provides a solid basis for understanding double Bollinger bands. 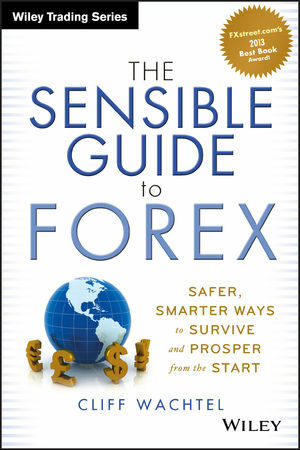 For more detailed coverage and examples, see Chapter 8 of the book, The Sensible Guide To Forex. When a trend is strong enough to continue riding or to enter new positions even if it has been going on for a long time, even at historical highs or lows where there are neither support nor resistance (s/r) points for reference. When there is no clear trend and you need to either stand aside or switch from a trend-following system to a range-trading system. When it’s time to take profits or to get ready to trade the reversal. Of the hundreds of technical indicators out there, the Double Bollinger Bands are hands down my favorite…they provide a wealth of actionable information. They tell me whether a currency pair is in a trend or range, the direction of the trend, and when the trend has exhausted. More importantly, Bollinger Bands also identify entry points and proper places to put a stop. While Ms. Lien refers above to currency trading, like most technical indicators, DBBs can be applied to technical analysis for any actively traded asset traded on big liquid markets like stocks, commodities, bonds, etc. First insert a standard set of Bollinger bands: Select the Bollinger bands option from your menu of indicators and for your settings select 2 standard deviations and 20 periods. That means you’ve selected a 20 period simple moving average (SMA) and 2 lines or Bollinger bands that move lock-step with it, at a distance of 2 standard deviations. Then, insert a second set of Bollinger bands: Repeat the above process, the only difference is that you select 1 standard deviation distance from your 20 period SMA. Consult your charting platform’s help menu if the process is unclear. For those without a statistics background, just know that for purposes of this discussion, standard deviations function as units of distance from the 20-period simple moving average (SMA), which is both the center line between the four DBBs and thus the baseline for determining the location of the 1 and 2 standard deviation Bollinger bands. If you want to know to know more about them, you can either search out the details online, or find further explanations in my book in chapters 4 and 8. See Chart 1 below for an example of what DBBs look like. Chart 1 shows example of what DBBs look like. Here’s an explanation of each line. A1: The upper BB (Bollinger Band) line that is two standard deviations away from line C, the 20-period simple moving average (SMA). B1: The upper BB line that is one standard deviation from the 20-period SMA. C: The 20-period SMA. Figure 8.2 is a weekly chart, so this is a 20-week SMA. Again, this is both the center of the DBBs and baseline for determining the location of the other bands. B2: The lower BB line that is one standard deviation from the 20-period SMA. A2: The lower BB line that is two standard deviations from the 20-period SMA. In short, the yellow BBs are an example of the typical “(2,20) default setting” BBs most commonly used, meaning that the BBs are 2 standard deviations’ distance from a 20 period simple moving average (SMA). The red BB settings are (1, 20), 1 standard deviation that same 20 period SMA, which is shown here in purple. Notice how these bands form four separate zones. The Buy Zone between lines A1 and B1. Neutral Zone 1 between lines B1 and C.
Neutral Zone 2 between lines C and B2. The Sell Zone between lines B2 and A2. Unless otherwise noted we treat both neutral zones as one, called The Neutral Zone. It’s these zones that provide the added information about the strength of a trend, whether it still has the momentum to continue, and where we might attempt to enter trades, even if there is no other support or resistance (s/r) to serve as a reference point, as was the case with gold during much of the period covered, when gold continually hit new historical highs. As you can see from Chart 1, DBBs create four zones around that 20 period SMA. However we combine the middle two areas and focus on three zones: upper quarter, the middle half, and the bottom quarter. The DBB Buy Zone: When price is within this upper zone (between the two topmost lines, A1 and B1), that means the uptrend is strong and has a higher probability of continuing. As long as candles continue to close in this uppermost zone, the odds favor maintaining current long positions or even opening new ones. The DBB Sell Zone: When price is in the bottom zone (between the two lowest lines, A2 and B2), the downtrend is likely to continue. That suggests that as long as the candles close in this lowest zone, one should maintain current short positions or even open new ones. Below we’ll discuss the best times for opening additional positions when in the DBB buy or sell zone. The DBB Neutral Zone: When price is within the area bounded by the one standard deviation bands (B1 and B2), there is no strong trend, price is likely to fluctuate within a trading range because momentum is no longer strong enough for us to trust the trend. 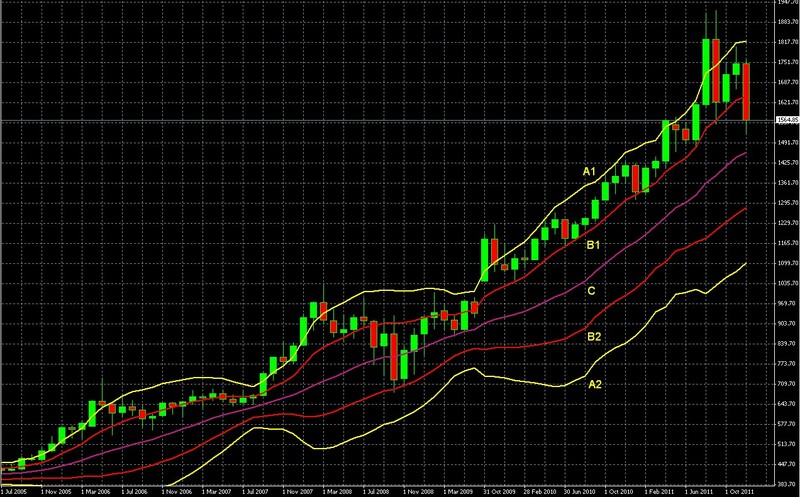 The 20-day simple moving average (C) that serves as the baseline for the Bollinger Bands is in the center of this zone. Trading in the direction of the trend, long or short, depending on whether the trend is up or down. Basically, if price is in the upper zone we go long, if it’s in the lower zone we go short. Refrain from trading if you’re a pure trend trader, or trade the shorter term trends within the prevailing trading range. That’s the basic signal if price is in the two middle quarters. That’s the simplest summary, however there’s a lot more to DBB signals than that, as we’ll discuss below. Your success with DBBs will depend greatly on how you respond when price transitions between the three zones. As with any technical indicator, the key question is: how much confirmation of a trend change do you wait for before you open a new position? As always, when an indicator sends a signal, we seek some kind of confirmation before trading. Obviously we usually don’t make trade decisions on the very first tick or closing candle into a new zone, at least not with more than a portion of our total planned position. Just like traders need confirming signals to avoid getting fooled by temporary, false breakouts beyond support or resistance, so too here we need ways to distinguish between false trend changes and real ones, between short-lived and sustained moves into different zones that could last long enough for a profitable trade. Sadly there isn’t one answer. You may simply apply the same criteria that you use to confirm breakouts beyond support or resistance for the given asset and time-frame. You may find from experience that you need to adjust those criteria to confirm moves between DBB zones. One to three candles closing in a new zone confirms that the move is real. The above, combined with price hitting a given level. For example, a breakdown past a chosen stop loss to take you out of a position, or a break though of a given resistance area to trigger opening a new position. A moving average crossover confirming signal that the momentum has shifted. For example a 10 period SMA crossing above a 20 or 50 period SMA indicates increasing momentum and would help confirm a move into the buy zone. The opposite occurrence, the faster SMAs crossing below that 50 period SMA, might be your confirmation of a move into the lower DBB sell zone and that it’s time to open new short positions. A major market moving news event might cause you to trim or close a position even before you have full technical confirmation. See the section on Rule 3 below for an example. Some other significant signal, like a move above or below a Fibonacci retracement level. The higher the risk of being fooled by a false move that soon reverses, and having a losing trade. The higher the reward of being right because you got in sooner and have more time to ride the move, so, your profit is greater. Conversely, the more confirmation you wait for, the lower your profit because you get in later, but the lower your risk of catching a false move and a losing trade. The balance that works for you will depend on both the volatility of the asset, your personal risk tolerance, and other risk and money management safeguards you already have in place that determine the damage you suffer from a given loss. For extensive details on risk and money management, as well as examples of how we apply these tools in actual trades, see Chapters 5 and 7 of The Sensible Guide To Forex. We’ll have more on getting confirmation in Part 2. In sum, DBBs help us decide when we should be trading a trend, a trading range, or refraining from trading. When the pair is in the buy or sell zone (above the top one standard deviation line or below the bottom one standard deviation line), we have a trend that is strong enough to continue trading; it’s probably not too late to get in, though ideally you’d wait for the trend to retreat to the first standard deviation line, and ideally wait for it to begin to rebound back in the direction of the rising or falling trend. More on that below. When the pair is within the neutral zone (between the one standard deviation lines), there is no reliable trend. Instead, we’re in a trading range. Those who only trade strong trends should refrain from trading. Even if the longer term trend is clearly still intact (as is the case with the final candle in Chart 1 above) the trend lacks enough upward momentum for us to assume that it will soon continue. For trend traders, the chances of further gains are too low, and the chances of a reversal are too high. The lower risk, higher reward move is to refrain from trading until price makes a decisive move into the buy or sell zone (we have a trustworthy trend) or switch to a range trading strategy. Those comfortable with trading within a flat trading range should shift to strategies and systems for trading bounces off the upper and lower channels. Note that if you’re just starting out with using charts and don’t yet have a brokerage account that offers full featured charting software, finding free charts that offer DBBs isn’t easy. The most popular financial portals like Yahoo Finance and the like typically only allow a single set of Bollinger bands. I did a quick search and only found 2 forex content sites that offer free charts that allow you to insert multiple sets of double Bollinger bands at whatever settings you choose. They weren’t bad, but don’t match the ease of use or many of the useful features of full charting packages. So if you don’t already have access to a full featured charting platform, I strongly suggest signing up for at least a practice account with a broker that offers MT4 or a similarly robust charting package. Ok, that was the background. Proceed to Part 2 for the 4 rules of using DBBs and examples of how we apply them. Those seeking just a brief summary will find one in Part 3 (coming in days) – just the basic rules and a chart illustration.